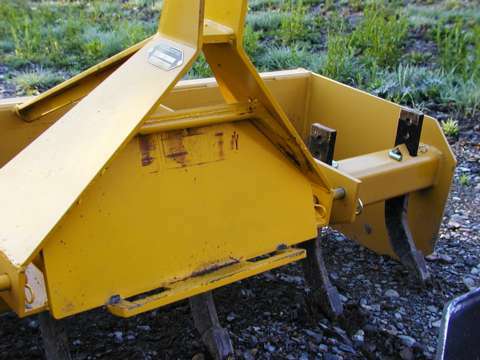 On this page is a list of the attachments I have for my Power-Trac PT-1845 and comments about the strengths and weakness I've found in some of them. 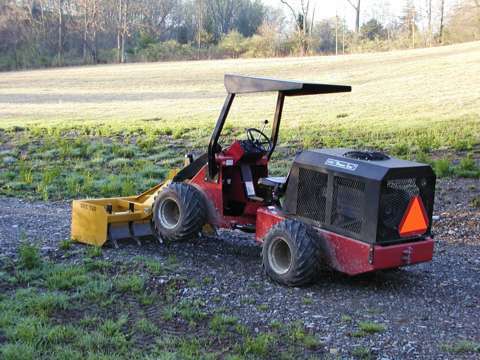 On 4/16/02 I purchased this Bush Hog SBX720 box blade s/n 1200181 for $549.00 plus tax, from Columbia Tractor - my long term local IH/Case/Kubota/etc dealers - good people. 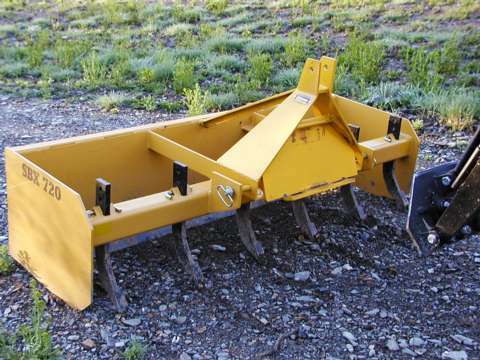 On 5/21/02 Columbia Tractor welded a Quick Attach plate to three point hitch assembly. 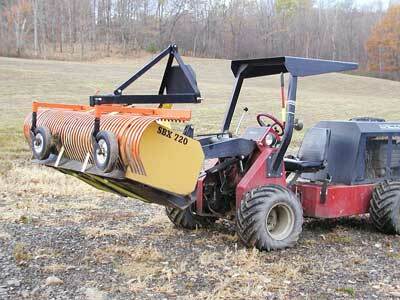 This rake has proven to be the least satisfactory of all my implement purchases to date. Silly me for assuming that, just because the blade pivots and there are stop pin holes on both sides, it will in fact pivot to face forward. Nope - there is a weldment in the way of the swivel. I think I can grind enough material away to get it to swivel so I can try pushing instead of pulling. The main frame is angle iron rather than a square tube. It's not nearly stiff enough and is all too easily twisted (by either dropping it too hard or by accidentally applying full down force while going into float) which effectively puts the center teeth lower than either end making grading difficult. I've straightened it a couple of times by pushing against a tree but in the long run it will need reinforcement. For quite a while I felt that at 8 feet it's a bit too long and that 7 would be better. With more experience I've decided the extra overhang beyond the tractor tires is useful in raking the edges of a road without the tractor needing to be too far off the track. I forget now why I wanted to know this but here it is anyway. The male QuickAttach plate assembly is a three point mount to the lift arms. Load the box blade in the small bucket. Put the landscape rake on top. Strap 'em together and go. I've travelled for miles with this kit. 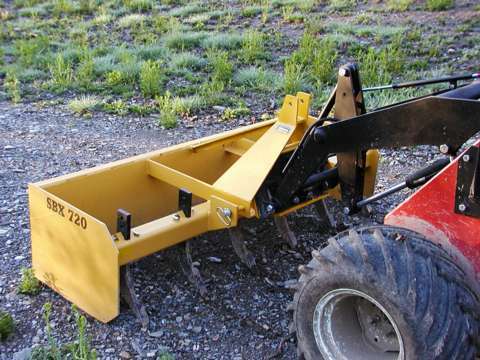 Take a small bucket and weld on a Quick Attach plate facing forward to make a mini grade-all - I think this would be useful in cutting sod along the edges of drives, cleaning ditches, etc. My attempt to build a dumptrailer modelled after PowerTrac's Mini Dumper is just in its earliest stages. So far I have acquired an old sprayer trailer frame, put some brush hog flap wheels on it and picked up these parts for a hitch and side stakes. The trailer is high and short. Briefly, the idea is to be able to fill the trailer with a bucket, drop the bucket, and pick up a Quick Attach plate with the pintle hook attached. 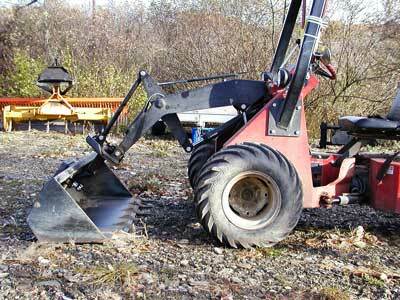 Then hook the trailer through the tow ring, move it, then lift it high to dump the load. Please NOTE this list is out of date.